Although this is named ISA International Sign Expo it covers a lot more than signage. You can find manufacturers and distributors of art canvas and photo papers. Plus, nowadays you can print your photos in raised relief, like a stained glass window. Or you can print your photos on metal, wood, ceramic, or stone. You can have your photos decorate honeycomb sandwich board to create life-sized 3-dimensional "sculptures". FLAAR has reports on each aspect of all this. And at ISA you can see and experience all the exciting new ink chemistries and unusual printable substrates. So we hope to visit you at ISA in 2014 in friendly Orlando, Florida. Serious vignetting on right side (not as much on left side) with Nikkor AF-S Micro 60mm 1:2.8 G ED lens. Why does Nikon work so hard to create so many issues and thereby suggest that people should buy a Canon EOS instead of a Nikon? Also battery cover fell off: this is the cheapest designed and cheapest made Nikon I have had in 40 years of photography. A shame, since the photo quality of images is awesome; as good as a Phase One P25+. But with the vignetting the results of the Nikon look cheap. I will see if this is some undesired software setting that was turned on my mistake. studio lighting equipment: fluorescent & tungsten halogen. studio light stands: pro quality. backdrops, especially background paper (and vinyl for wet things). tripods, especially tall tripods (for photographing things high in trees). Low tripods (for doing macro close-ups of ants, scorpions, tarantulas). memory cards (CF size and SD cards). 500mm, 600mm, 800mm telephoto lenses. firing multiple flashes simumtanously (mainly out in the field). telephoto flash accessories (for projecting flash in bird photography). underwater housings for DSLR cameras. wide angle photography (architecture, eco-systems). panorama photography (Guatemala is our favorite place for this). carrying cases (especially weather and dust-proof cases). gigs for holding DSRL video systems. Architectural photography (Hellmuth family background via HOK Architects). Landscape photography (Ozark Mountain area, and all of Mesoamerica). Eco-system photography: swamps, tropical rain forests, deserts, volcanos (Guatemala has every eco-system except glaciers!). Bird photography (imagine the gorgeous birds in Central America). Arachnids (spiders, scorpions), Amblypygids (my favorite). Bees, especially the friendly stingless bees (Meliponia). Lightning bugs, especially the giant ones the size of a healthy cockroach. Butterflies (we raise several species already). Reptiles, especially crocodilians and venomous snakes (worshipped as deities by the Maya and Aztec for millenia). Other reptiles: turtles, especially sea turtles and snapping turtles. Amphibians, especially remarkable toxic toads (not the dart frogs of South America, but the toxic toads of Guatemala). Shellfish, crustaceans and mollusk (again, pictured in murals and mythology a thousand years ago). Felines (jaguars, pumas, margay, jaguarundi, etc). Bats (especially vampire and one other absolutely even more deadly incredible bat of Guatemala; plus necter-feeding bats). Tropical flowers (especially those eaten, used as flavorings for cacao a thousand years ago, and/or sacred flowers). Tobacco and all other plants smoked by Aztec and Maya (sorry, we do not test their chemicals; we only photograph their awesome flowers). Plants which produce natural organic dye for native cotton (for Maya clothing). PMA is working hard to recuperate from the downsizing of the PMA expo which so many of us photographers are used to from the 1990's and early 2000's. We looked forward to bringing to the thousands of photographers who read our digital camera reviews news from PMA@CES 2013. But what we found was that many booths of camera companies were not in the PMA section whatsoever: Nikon and many others were far away in the main CES halls. It was nice to see the new lighting equipment of Lowel, in the booth of Tiffen. 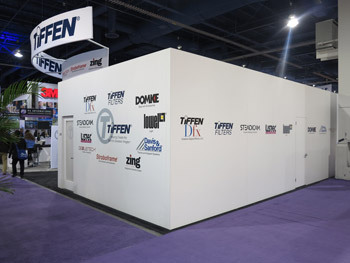 I visited this booth twice, because both Lowel and Tiffen are well known names in the photo equipment industry. Since we already have Canon EOS 1Ds Mark III and a Nikon D800E, I spent time in the Pentax booth to inspect their medium format, and their DSLR camera, as we are looking for a DSLR+telephoto lens to test for bird photography. 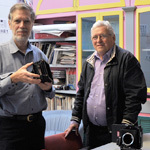 We visited easyCover Cameracase, a rubber-like outer shell to put around your Canon or Nikon. It works on all entry-level and mid-range DSLR cameras of the two brands. Since Hoodman was not present, we visited SanDisk and Lexar. Manfrotto Distribution had a hotel suite office, which I was able to reach a few minutes before the expo closed on the last day. I like Gitzo tripods and Manfrotto tripod heads (plus Avenger light stands and other great products). What was left in the PMA section was rather modest. It looked no better than 2012, and actually had fewer booths. Attendance at PMA was most politely described as barely present, which is a surprise since less than 100 meters away over 150,000 people are attending CES. 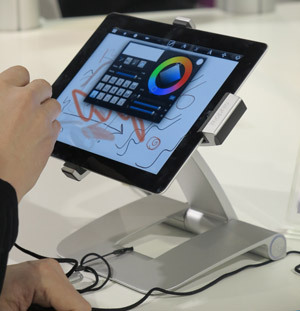 Although thousands of products are at CES 2013, we at FLAAR Reports look for practical equipment, which is useful to graphic designers, photographers, and illustrators. 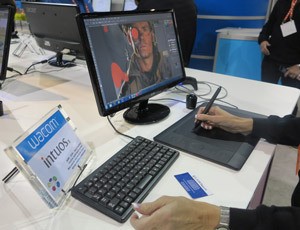 We have enjoyed seeing Wacom at Photokina every two years, and at other expos, and now at CES 2013. We will have a web page on these products later this month, and hope to begin evaluating Wacom tablets with review articles by February. But it was great to see the booth of SAVAGE backdrops. They have several innovative new products. We will be updating our discussions of SAVAGE products during March and April this year. From PMA we flew to Dubai, where FLAAR is a consultant to the organizers of that expo. We are also consultants to organizers of digital printing expos in Istanbul, Johannesburg and USA, and we are VIP guests at digital printing technology expos in China. The Nikon D800E has been a disappointment so far. It feels flimsy; it feels cheap. Sorry, even though I tend to have better experience with Nikon cameras than Canon (over the last 20 years), the blunt truth is that the Canon EOS 1Ds Mark III is so good that it will be tough for another camera to impress me (except for a Hasselblad or Phase One medium format: they are light-years ahead in quality, especially with CaptureOne software; though my older version Capture One crashes several times a day). The Nikon D800E finally (after less than 20 hours using it) refused to accept a CF card. All our CF cards work just fine with our Canon and Phase One (sorry, can't blame this on the CF card). We sent the camera back to Nikon and we will request a full refund, including shipping, if we don't receive a complete NEW replacement camera. So far Nikon of course has not responded. No surprise (though it is an international holiday period). Finally we learned that it took FIVE WORKING DAYS for the camera to get from receipt (on Jan 2nd) to them sending an acknowledgement (Jan 9th). So an entire week was lost within Nikon Inc repair facility. Since I liked my Nikon D100, Nikon D200, and Nikon D300, and since the original Canon EOS 5D was a clunker, and one of the subsequent Canon EOS 1-something or other could not focus in the dark (unfortunately I was in a huge cave in Serbia for the test field trip), I was hoping to find a great Nikon. I visited the Nikon booth at CES and the polite person in the booth said that I should not have expected a camera anywhere near the solid build quality of the Canon EOS 1Ds Mark III from a Nikon D800E. At least he was honest. I telephoned Nikon repair department, stunned that that it took one week to get from receipt desk to repair desk. Finally they let me speak to a manger. 48 hours later the camera came back to me by FedEx or UPS overnight delivery, in time for my flight to Dubai, so I will praise their manager staff. Now I will see how the camera functions out in the real world once I get back to Guatemala (where we do our evaluations, since I have all my Canon equipment for the assignments in Dubai). Updated on Sept. 18, 2012. First posted Sept. 17, 2012. Nicholas and Sofia were in Cologne, Germany, taking notes on what we saw at Photokina 2012. We already have a new Canon 1GX (to see if it is a good compact camera) and we have our own new Nikon D800E (to check out DSLR and video capability). Our main interest was to see how medium-format digital backs are holding up to increased megapixel sizes claimed by Nikon. We at FLAAR Reports use both medium format digital backs, Canon EOS and Nikon D-series cameras. We avoid being sham-reviewers or pseudo-reviewers. FLAAR Reports actually uses the cameras which we write about (and we do not get kick-backs or even sales commissions). We do not get click-thru kick-backs either. If you want a review which is merely a PR trick pretending to be a "review" then the FLAAR Reports is not the place to be. Sorry, we are photographers (research photographers), not a commercial sales front. Precisely because FLAAR Reports are truthful, people notice what we write. We love Photokina, but, wow, the expo really shrunk, and some halls look semi-abandoned (Hall 6) and Hall 5.1 looked like a cheap half-empty basement. Being low-bid getting rid of carpets in the aisle makes the place look cheap (and abandoned). Making aisles double width and triple width merely reminded you that the exhibitor list shrunk (entire Manfrotto Gitzo booth has disappeared from Hall 9; maybe it is elsewhere?). Hall 2.1 still had the glory of the Photokina of the last 14 years, but Hall 1 seems to have disappeared totally. We found lots to see and learn about, but the organization sure has fallen. Zilch in Cologne airport to welcome people. Very sad. We will work hard to find what is still worthwhile seeing at Photokina 2012, but really was a shock to see how pathetic some halls have become. Fortunately a few halls are still vibrant (and the expo is larger than PMA@CES + PhotoPlus (PhotoEast) put together. But definitely needs something to improve the perception. 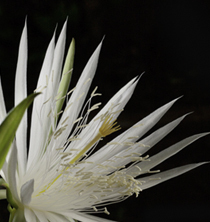 An exhibit of about 75 photographs of Nicholas Hellmuth and Sofia Monzon show sacred tropical flowers of Guatemala. This beauty of the gorgeous flowers is revealed with impressive photographs taken with Canon and Hasselblad cameras, mostly at 21 megapixels. You can see this exhibit at the Missouri Botanical Garden in St Louis, or in the FLAAR Reports which are being issued this week. Which is advisable for printing photographs: HP, Canon, or Epson? Most recently updated March 14, 2012. First posted March 5, 2012. Updated March 6, 2012. During 2012 we will be evaluating water-based photo printers from HP, Canon, and Epson. The goal is to assist our over 496,000 readers (per year) to see better the pros and cons of HP Designjet, Canon iPF, and Epson Stylus Pro printers. We now have a list of all the Canon iPF imagePROGRAF printers of the last ten years. 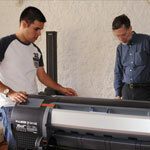 We also have a list of all Epson printers of the last twelve years (on our sister site, www.FineArtGicleePrinters.org). And, since we prefer to cover all three brands of aqueous printers with equal coverage, we have a list of all HP Designjet printers of the past fifteen years (on our web site devoted to water-based printers, www.wide-format-printers.org). 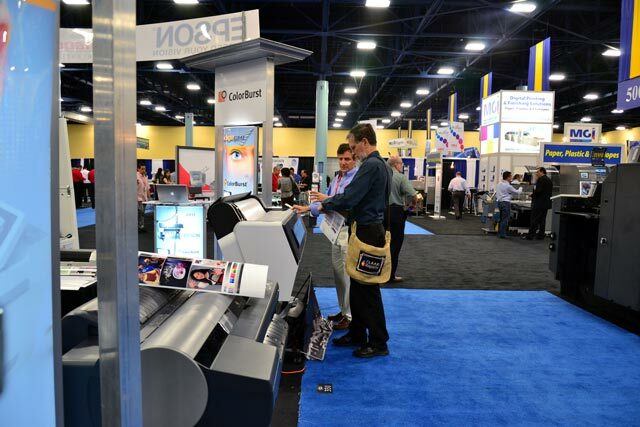 Here is a photograph of Dr Nicholas inspecting a recent-model printer at Graphics of the Americas expo, Miami, March 1-3, 2012. Two weeks later he was in Beijing inspecting additional models of Epson Stylus Pro printers which are available primarily only in China. 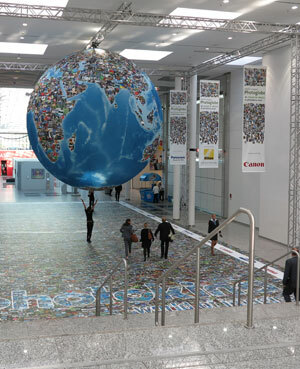 Photokina is held every two years, in the autumn, in beautiful Cologne, Germany. FLAAR photographer Eduardo Sacayon had an exhibit there last year and perhaps we at FLAAR may exhibit again. 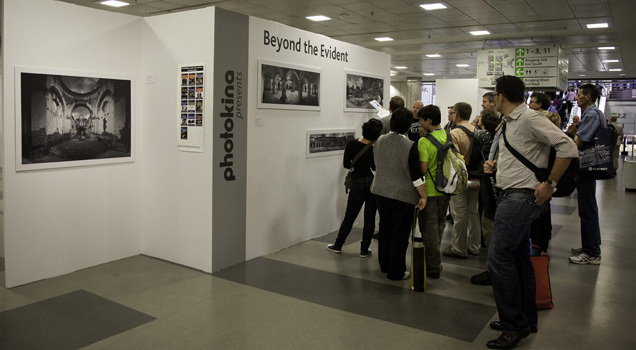 I have faithfully attended Photokina every two years since 1998, and I look forward to attending again. We look forward to seeing the exhibitor list Photokina 2012 and I am looking forward to seeing all the equipment and all the exhibits. Updated Jan 10, 2012; updated Jan 16, 2012; updated Jan 30, 2012. I enjoyed PMA for many years, but too many trade show organizations did not provide adequate events as the Internet took over the role of display for products. If you can see everything on the Internet, why go to a trade show if it is dull and boring. What sealed the fate of PMA was selecting Anaheim as location and then Epson pulling out one year and then Canon pulling out the next year. I stopped even looking at what was left of their exhibitor list. Evidently enough people at PMA woke up to reality and they did what other floundering trade shows are doing: co-locating. So, PMA@CES is attempting to be relevant. Sadly the PMA exhibitor list on their (inadequate) web site the days before the expo opened was so short I could hardly believe this was the PMA that I used to visit year after year. Major manufacturers are simply not present. I was really surprised and totally disappointed. Plus photo related exhibitors which are present (either at CES or PMA locations) were either not listed at all or poorly listed. But there were several items of photography equipment that I wished to evaluate and write reviews on, so now I am at PMA. I will try to find something nice to say about the expo (though there is no signage to guide you through The Venetian complex for PMA whatsoever, zilch. As if PMA does not want to exist). Even inside The Venetian, supposedly where PMA is supposed to be, there were no directional signs to PMA. But once I eventually found the area of PMA, it was nicely organized inside (even if not in the catalog and especially not on any web site). I saw lots of colleagues and had many informative discussions. Met owners and managers of several new companies. Plus I visited key booths of photo equipment in the CES area several miles away from The Venetian (at the Las Vegas Convention Center) such as Manfrotto. I enjoyed stopping at the CELESTRON booth, to see their impressive telescope that can take a digital camera. Four FLAAR Reports will result: a free download on camera equipment at PMA + at CES; free download of general comments on CES; and a special consulting report for trade show organizers who would like to learn how to avoid the issues (one on PMA@CES; the other consulting PDF on CES by itself), headaches, problems, omissions, inadequacies that were so glaring at CES. All four should be ready by Friday this week. You can order the report on how to improve management of your trade show by writing FrontDesk "at" FLAAR.org. The other two reports will be free downloads as soon as they are finished. Daniela and Nicholas spent two days at PhotoPlus in NY. A surprise blizzard dumped so much snow on New York the third day, we were stuck out at the NY Botanical Garden and never made it back to the city in time to get to the third day of the photo show. The FLAAR Report on tripods, tripod heads, digital cameras, accessories exhibited at PhotoPlus will be out this coming week. Last year was a Photokina Year, so I skipped PhotoPlus. But in 2011, there is no Photokina, so it's good to visit PhotoPlus in New York. So I will be at PhotoPlus 2011 together with biologist and student photographer Daniela Da'Costa. I am curious what I will find in the PhotoPlus 2011 exhibitor list. Previously updated April 21, 2014. Previously updated March 5, January 3, 2012, September 26, 2011 and September 12, 2011.